Mysuru: All roads in Mysuru literally led to Bengaluru this morning with over 5,000 people travelling in specially-arranged buses and vehicles to the capital city from Mysuru to hear Prime Minister Narendra Modi who is scheduled to address a massive rally at Palace Grounds in Bengaluru at 4 pm. Over one lakh people are expected to participate in the rally at ‘Krishna Vihar’ inside the sprawling Palace Grounds. It will be the PM’s first public rally after the Union Budget presented on Feb.1 and the rally is significant as he will sound the BJP bugle in the poll-bound Karnataka. His address will mark the conclusion of the saffron party’s 90-day Nava Karnataka Parivartana Yatra. Modi’s special plane will land in the HAL airport in the heart of the city at 3.30 pm. He will take a chopper to the venue and address the rally at around 4 pm. In the run-up to the State election, due in late April and early May this year, BJP conducted the Yatra, crisscrossing nearly all the 224 Assembly constituencies across the State after its National President, Amit Shah, flagged it off in November 2017. The Yatra, held with a view to bring BJP back to power in the southern State on the plank of transforming Karnataka through development, was led by its State President and former CM, B.S. Yeddyurappa. 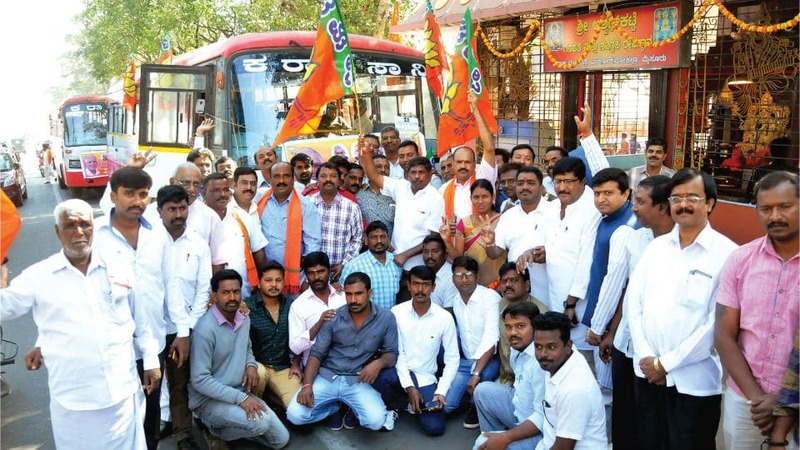 From Mysuru, over 5,000 people have left for the rally in over 80 buses that have been arranged by the City BJP unit. Of them, 72 buses are from KSRTC and eight are private buses. From Kodagu too, a sizable number of private buses have been arranged for the rally. This apart, from Mysuru, over 50 Tempo Travellers and maxi-cabs have been hired to ferry the crowd. Cars have also been arranged for senior party leaders and ticket aspirants. As the buses left Mysuru batch-by-batch since morning, breakfast for the passengers was arranged at Srirangapatna. Lunch has been arranged at the Palace Grounds where over 600 cooks are preparing food. The participants will be brought back to Mysuru and Kodagu after dinner that has been arranged at Bidadi. At the Palace Grounds, elaborate arrangements have been made for Modi’s visit to the IT hub. 20 LED screens, three helipads and a mini healthcare unit have been set up at the venue. A separate enclosure has been set up for techies to listen to the Prime Minister. Over four cooking halls with 600 cooks have been set up to prepare food in 250 counters for breakfast, lunch, and dinner. Auto-tippers and compactors have also been hired to remove garbage from the venue after the event is over. A 13,000-strong Police force has been deployed to ensure security and maintain law and order during the rally. The Police have installed CCTV cameras at the venue and have conducted verification drills at hotels and lodges, and are monitoring movements at bus stands, the international airport, and railway stations. Besides Modi, party’s Central Ministers Prakash Javadekar and Piyush Goyal who are in-charge of the BJP poll campaign in Karnataka, Ananth Kumar, D.V. Sadananda Gowda and Anant Kumar Hegde who hail from the State and the party’s all-State leaders will also participate in the rally and address the public.